I probably have the least organized grocery system of any homemaker I know. I'll confess: there is no weekly grocery list. While my style is a bit more by-the-seat-of-my-pants, I manage to put healthy meals on the table and keep my $50/week budget in check. My two big tools are from the Tightwad Gazette: the price book and the pantry principle. The oft-touted price book is simply a way to track your lowest price per item for the stores in your area. I update mine more infrequently now that I've been shopping so long. Still, it's essential for those odd-ball items or shopping trips when you just can't do the mental math. Today's shopping trip was no exception. 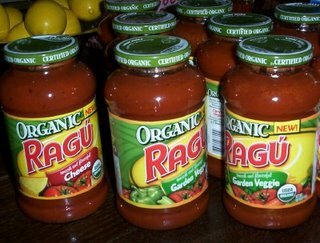 If you looked at the food I brought home, you might wonder, "What kind of meal can come out of three jars of sugar-free jam, all that Ragu, two loaves of bread and six packs of cheese?" But, combined with weeks of similar shopping, I have enough ingredients on hand to make several tasty meals without the help of grocery list. Do you make your own price book or do you have to buy one? Is it a page for each item you buy, where and cost? I have heard of them often but have never seen one in use or even advertized. I hate to buy something I can make myself! Is that frugal or cheap? You make it yourself. There are several places with good info. That's the link on my blog to my entry about it. I have links to two sites that give examples as well as info on my own. Just another great way to track your spending--and one that doesn't cost anything but your time and attention. How do you use up all that Ragu if your family doesn't eat high carb stuff like pasta? Janey, when I've made a big buy, I tend to use it everywhere a recipe would call for a tomato-based product. I get more tomato flavor than in one can of organic diced tomatoes (on sale for $1 a can at Kroger), for instance. So I improvise and use the jarred sauce for as long as I have it on hand: on low carb tortilla-based pizzas (enriched with a little Italian seasoning), in the egg lasagna recipe mentioned last month, and in staples like meatloaf or anywhere tomato soup is called for. Hillbillyhousewife.com has great instructions for making your own tomato sauce on the cheap, but to get all organic ingredients for $1 a jar is hard to beat, too. I can't BUY tomatoes, organic or not, for that cheap. And I found out that I can't grow it myself that cheap either. Do you all check out Big Lots for organic food? I have found organic canned tomatoes there for 49 cents a can often and canned soups and veggie and chicken broths and such. Also no sugar cookies. Ya never know what you will find but keep a watch when there shopping for other things. I also stocked up on the organic Ragu! Thanks all of you for all the ideas! Remember an old question about what to do with leftover egg yolks when making your egg=white lasagna (mentioned above)? LEMON CURD. It is not exactly low carb : ( but my favorite way to use yolks. Sara Moulton has a very delicious cookie recipe using lemon curd on Foodnetwork.com. I have an old british recipe, you jar the results and it keeps a couple weeks in the fridge. Fabulous on biscuits, swoooooooon. Ok I need to be educated! I understand how to make the Price Book, I don't understand how to use the Price Book. Once I have the Price Book ready, I take it shopping and everytime I buy something in it I write it down again? That means I need to leave lots of room between items listed right? I really must be blond (no pun intended) but I just don't get it. Help? Thanks for the help by the way. That's okay, I've read about it many times. Even tried on my palm (the only thing I ALWAYS have with me when I shop) using a program called Handyshopper -- I know all the theory. I'm still having a problem making it work for me. I miss 50 dollars a week. So much! I used to be able to feed my family of five on 50 bucks. But now we're missionaries in France and my food bill has quadrupled. Seriously! Oh la la!